Johnson's New Military Map of the United States showing the Forts, Military Posts etc. with enlarged plans of Southern Harbors from Authentic Data Obtained at the War Department Washington. Printed at the height of the American Civil War, this is a fine example of Johnson's 1863 Military Map of the United States. Created at the height of the American Civil War, this map was issued by Johnson in order to capitalize on the general interest in the War. This is the more desirable of the two extant variants of this map. 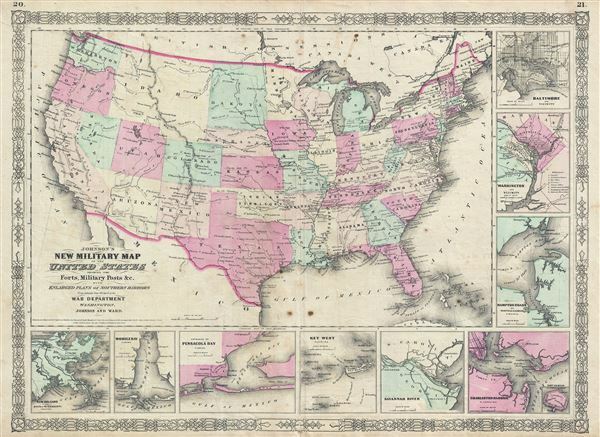 This variant, showing a layout of the states rather than military zones, offers a wonderful insight into the political situation shortly following the outbreak of the American Civil War. Shows the various states and territories along with several hundred forts and other military installations. Johnson issued various editions of his Military Map, this being the scarcest and most historically significant due to is rendering of the large Idaho Territory before its eastern parts were ceded to Montana and Dakota Territories in 1864. Arizona extends westward into what is today the Las Vegas region of Nevada while Dakota and Virginia remain singular. Oklahoma is still named the Indian Territory. The map is surrounded on the bottom and right by views of important southern harbors, including Baltimore, Washington D.C., Hampton Roads and Norfolk Harbor, Charleston Harbor, the Savannah River, Key West, Pensacola Bay, Mobile Bay, and New Orleans with the Delta of the Mississippi. Features the fretwork style border common to Johnson's atlas work from 1863 to 1869. Published by Johnson and Ward as plate nos. 20-21 in the scarce 1863 edition of Johnson's Family Atlas. This is the second edition of the Johnson atlas to bear the Johnson and Ward imprint. Very good. Minor wear along original fold lines. Some spotting at places. Text on verso. Rumsey 0352.017. Philips (Atlases) 843. Lourie, Ira, Johnson Map Project, New Military Map of the United States 5.0.